Jean-Pierre Gagnon grew up on the banks of the Bayonne River. 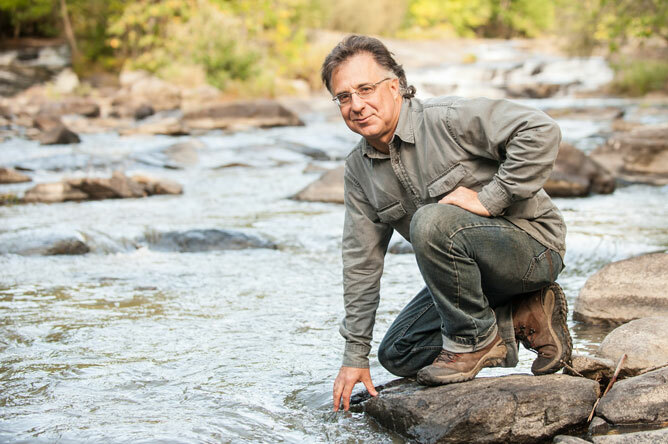 In 1995, his concern about water quality in the river led him to set up the Comité des Amants de la Bayonne, together with Louis Trudeau and Ghislaine Guindon. 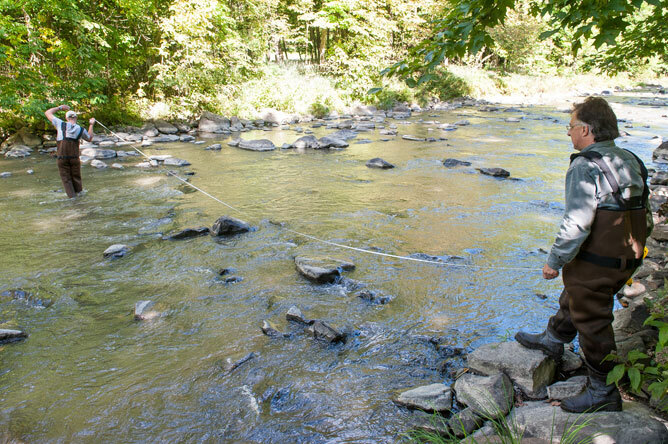 This committee aimed to understand people's perceptions of the river, and launched various initiatives to raise awareness concerning water quality and shoreline protection. When the Québec Water Policy was introduced in 2002, the committee applied to become a watershed agency, the Organisme de bassin versant de la rivière Bayonne, which was officially registered in 2005. 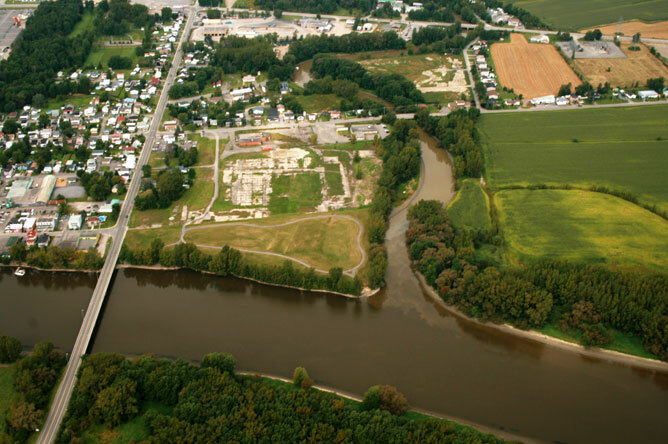 In 2009, the Chicot, Saint-Joseph, Chaloupe and Cachée Rivers were added to the territory covered by the agency, and its name was changed to the Organisme des bassins versants de la Zone Bayonne (OBVZB). 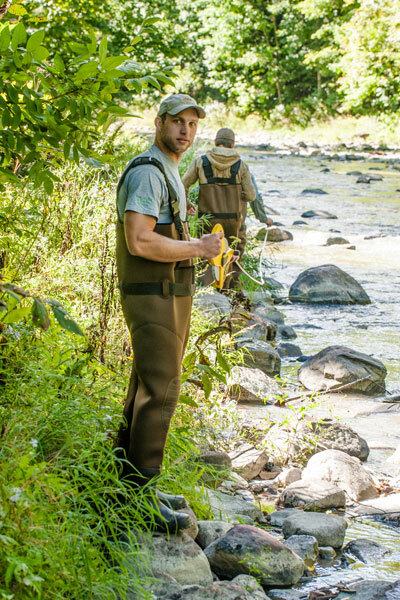 As the Managing Director of the OBVZB, Jean-Pierre Gagnon is passionate about the many projects taken on by his team. 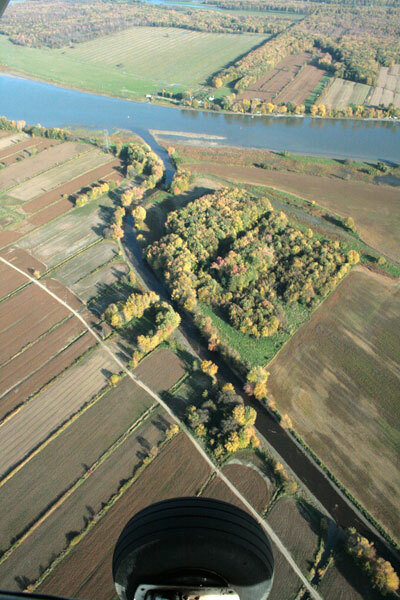 For the past four years, the Organisme des bassins versants de la Zone Bayonne (OBVZB) has also participated in the SurVol Benthos river and stream monitoring program developed by the Education and Water Monitoring Action Group and the Ministère du Développement durable, de l'Environnement, de la Faune et des Parcs du Québec (MDDEFP). 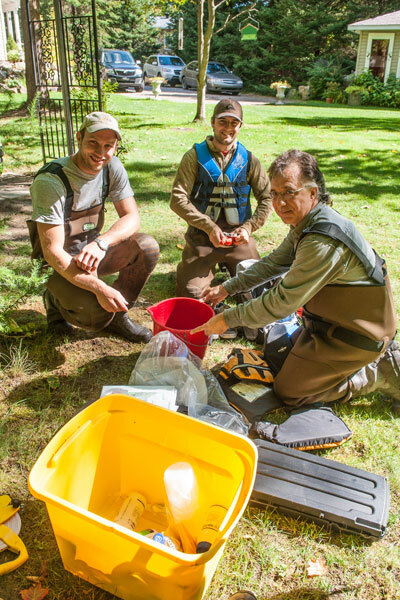 (Left to right) Jacques Lajeunesse, Jonathan Beaudry and Jean-Pierre Gagnon prepare equipment that will be used to collect benthos from the Bayonne River near Île Tessier. 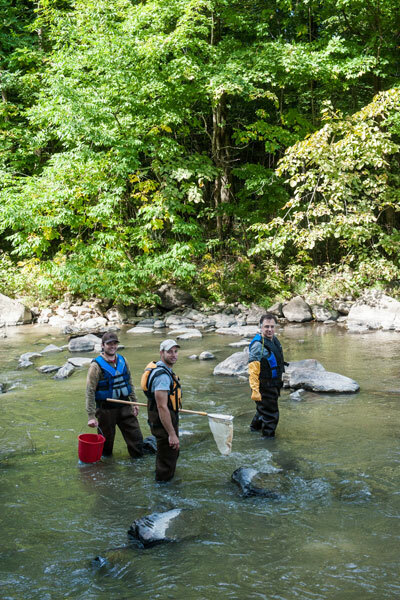 The first step involves measuring the station from which benthic macroinvertebrates will be collected. The length of the station must be equivalent to six times the width of the river. Twenty sampling sites are randomly selected from within that area. Six different locations are sampled each year: two stations on the Bayonne, two on the Chicot, one on the Chaloupe and a control station on the Berthier. The last station is used as a reference, as it is less subject to pressure from human activities. The width of the Bayonne River is measured near Île Tessier. 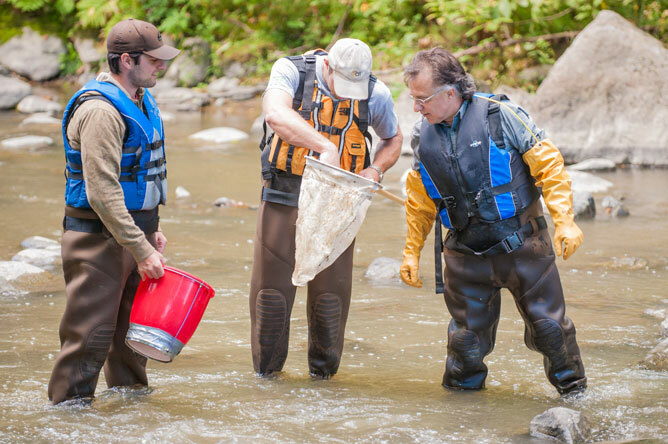 Benthic macroinvertebrates are collected with a kick net and a bucket. Jean-Pierre Gagnon wears long gloves to plunge his arms underwater and reach the sediments and rocks that harbour benthic organisms. The samples are filtered to remove debris and sediments and isolate macroinvertebrates, which are then preserved in vials of alcohol. Species are then identified in the lab. 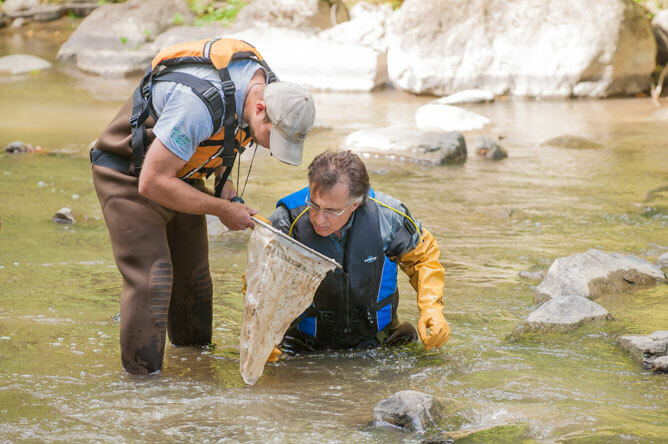 Macroinvertebrate species can be sorted into three categories: pollution tolerant, moderately pollution tolerant, and pollution intolerant. 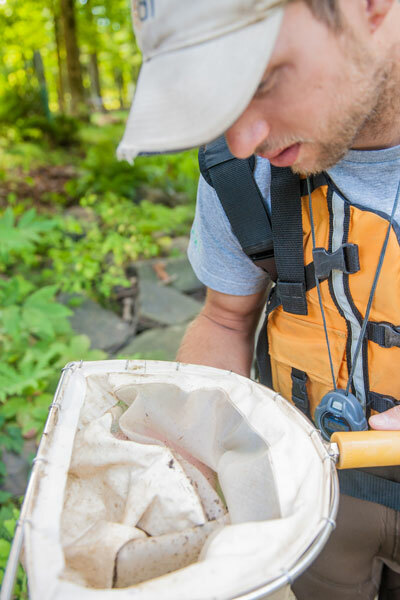 By participating in the SurVol Benthos program, the Organisme des bassins versants de la Zone Bayonne (OBVZB) is helping researchers draw up a portrait of the targeted rivers and understand how they change over time. 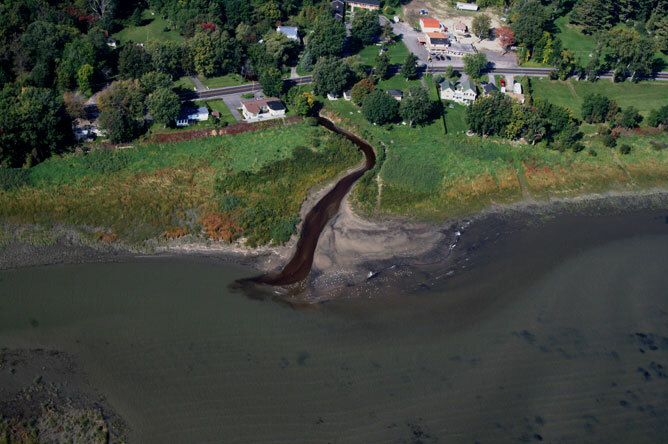 This means that we can now verify whether interventions to reduce shoreline erosion have an effect on the macroinvertebrate species collected. Jean-Pierre Gagnon believes that the size of the territory covered by the Organisme des bassins versants de la Zone Bayonne (OBVZB) is ideal, as it allows his team to get to know the main stakeholders. The OBVZB encourages citizens to get involved and works with agro-environmental advisory clubs that support farmers who want to improve their practices. A major educational initiative introduces children to wetland environments and shows them why these ecosystems need to be protected. Children who have learned about the importance of preserving the environment are more likely to adopt eco-responsible behaviour in their adult lives.